Iridium: Mineral information, data and localities. Natural iridium often contains distinct amounts of Os, Ru or Pt. The definition of iridium now incorporates old "osmiridium" and "ruthenosmiridium" mineral species (all have Ir as the dominant element). Note: The type locality is not determined. Aurosmiridium A solid solution of Gold and Osmium in cubic Iridium. Originally reported from Urals Region, Russia. Osmiridium A variety of Iridium rich in Osmium. Platiniridium A variety of Iridium rich in Platinum. 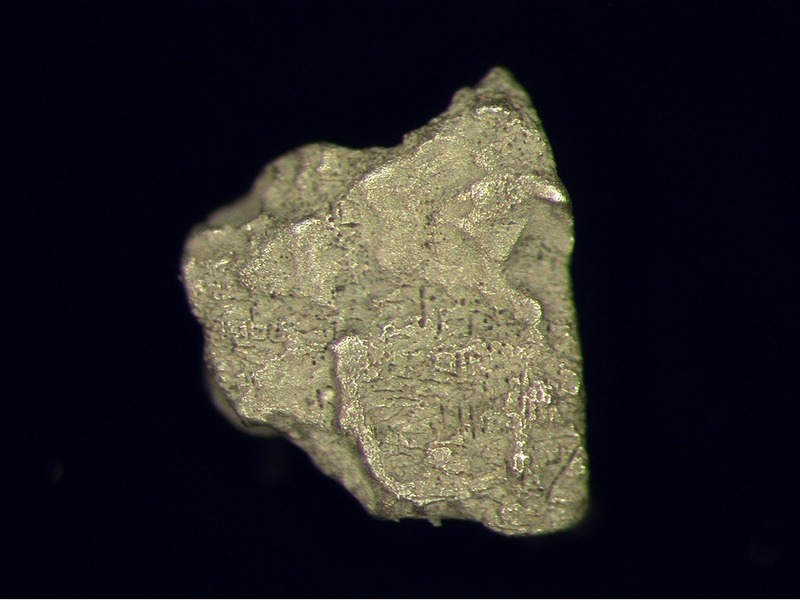 Platosmiridium Rare cubic Ir-Pt alloy often with admixture of Os. Ruthenian Iridium Cubic alloy in system Os-Ir-Ru with contents Ir less than 80 at.%, Os less than 10 at.% and Ru in range 20-43 at.%. 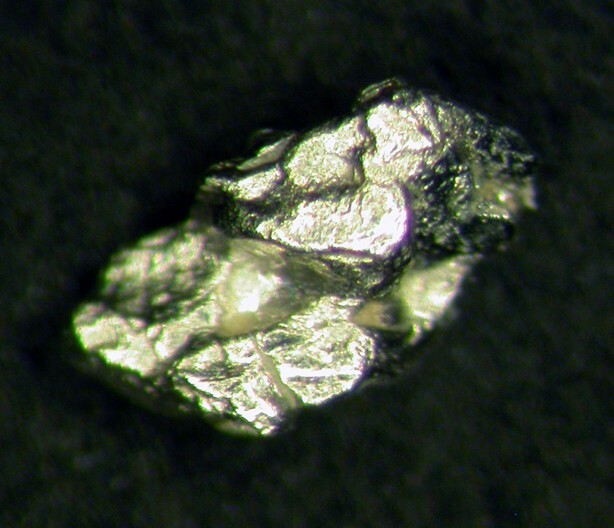 Rare variety of cubic native Iridium. 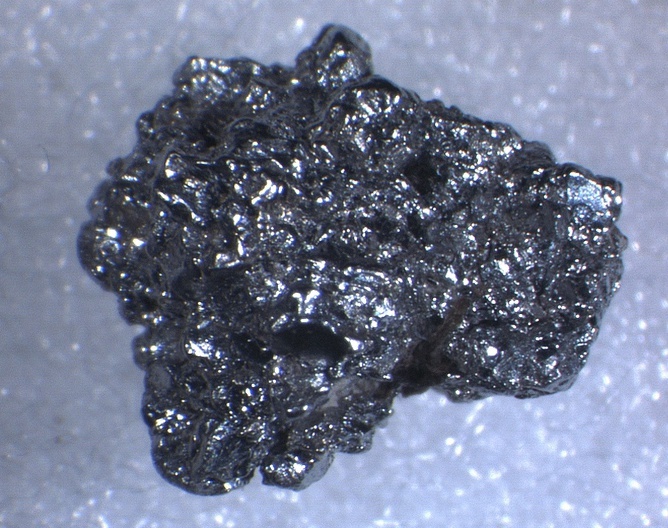 Rutheniridium Originally a ruthenium-rich variety of Iridium, however as all natural Iridium contains ruthenium this name is now regarded as synonymous with Iridium. Ruthenosmiridium A variety of iridium rich in ruthenium and osmium. Not to be confused with rutheniridosmine. Osmium 4 photos of Iridium associated with Osmium on mindat.org. Osmiridium 2 photos of Iridium associated with Osmiridium on mindat.org. Isoferroplatinum 1 photo of Iridium associated with Isoferroplatinum on mindat.org. Rutheniridosmine 1 photo of Iridium associated with Rutheniridosmine on mindat.org. Iridosmine 1 photo of Iridium associated with Iridosmine on mindat.org. Chengdeite 1 photo of Iridium associated with Chengdeite on mindat.org. Ferronickelplatinum 1 photo of Iridium associated with Ferronickelplatinum on mindat.org. Laurite 1 photo of Iridium associated with Laurite on mindat.org. Iridian tulameenite 1 photo of Iridium associated with Iridian tulameenite on mindat.org. Gold 1 photo of Iridium associated with Gold on mindat.org. Cabri, L.J., Feather, C.E. (1975) Platinum-iron alloys; a nomenclature based on a study of natural and synthetic alloys. The Canadian Mineralogist: 13: 117-126. Carlo Tortorella; Webb, K. (2014). The age and tectonometallogenic setting of the Fifield “Alaskan-type” intrusive suite, Lachlan Orogen, NSW. NSW., Bachelor of Science (Honours), School of Earth & Environmental Sciences, University of Wollongong. Bacon, C. A. (1992). Notes on the History of Mining and Exploration at Adamsfield. Mineral Resources Tasmania. ; Cabri L.J., & Harris, D. (1975). Zoning in OS-IR Alloys and the Relation of the Geogical and Tectonic Environment of the Source Rocks to the Bulk Pt: Pt+Ir+Os Ratio for Placers. Canadian Mineralogist, 13, 266-274. Bottrill, R.S., 2014. Mineral deposits associated with the mafic-ultramafic complexes. In: Corbett, K.D., Quilty, P.G. and Calver, C.R. (editors), Section 4.4.7. Geological Evolution of Tasmania. Geological Society of Australia Special Publication 24, Geological Society of Australia (Tasmania Division), 141–145. Bottrill, R.S., Bacon, C.A. and Duncan, D.McP, 2014. Cenozoic mineral deposits. In: Corbett, K.D., Quilty, P.G. and Calver, C.R. (editors), Section 10.3. Geological Evolution of Tasmania. Geological Society of Australia Special Publication 24, Geological Society of Australia (Tasmania Division), 539–548. Keays, R. R., & Jowitt, S. M. (2013). The Avebury Ni deposit, Tasmania: A case study of an unconventional nickel deposit. Ore Geology Reviews, 52, 4-17. Alfredo Petrov specimen, obtained from Lismarck Minerals, analysis #19 14/04/06. Alfredo Petrov collection; Nixon, G. T., Cabri, L. J., & Laflamme, J. G. (1990). Platinum-group-element mineralization in lode and placer deposits associated with the Tulameen Alaskan-type complex, British Columbia. The Canadian Mineralogist, 28(3), 503-535. González-Jiménez, J. M., Proenza, J. A., Gervilla, F., Melgarejo, J. C., Blanco-Moreno, J. A., Ruiz-Sánchez, R., & Griffin, W. L. (2011). High-Cr and high-Al chromitites from the Sagua de Tánamo district, Mayarí-Cristal Ophiolitic Massif (eastern Cuba): constraints on their origin from mineralogy and geochemistry of chromian spinel and platinum-group elements. Lithos, 125(1), 101-121. Coggon, J. (2010). Application of the 190Pt-186Os isotope decay system to dating platinum-group minerals (Doctoral dissertation, Durham University). Urashima et al (1972) Reports of the Faculty of Science, Kagoshima University, 21, 119-135. Khoon, S.Y. (1982) Osmiridium - a discovery in Cheroh, Pahang, Peninsular Malaysia - and its significance. Geological Society of Malaysia, Bulletin 15, 141-151. Christie, T., Challis, A. (1994) Mineral Commodity Report 5 - Platinum group metals. Institute of Geological and Nuclear Sciences Ltd.
Nesterenko, G. V., Zhmodik, S. M., Airiyants, E. V., Belyanin, D. K., Kolpakov, V. V., & Bogush, A. A. (2017). Colloform high-purity platinum from the placer deposit of Koura River (Gornaya Shoriya, Russia). Ore Geology Reviews, 91, 236-245. Okrugin, A. V. (1998). Mineralogy, Types, and Origin of the Platinum-Bearing Placer Deposits of the Siberian Platform. International geology review, 40(8), 677-687.; Okrugin, A. V. (2011). Origin of platinum-group minerals in mafic and ultramafic rocks: from dispersed elements to nuggets. The Canadian Mineralogist, 49(6), 1397-1412. Zaccarini, F., Pushkarev, E., & Garuti, G. (2008). Platinum-group element mineralogy and geochemistry of chromitite of the Kluchevskoy ophiolite complex, central Urals (Russia). Ore Geology Reviews, 33(1), 20-30. 9th International platinum symposium Chromite-PGE mineralization in the Uktus Alaskan-Type Complex (Central Urals,); (2014) 12th International Platinum Symposium p283; Zaccarini, F., Pushkarev, E., Garuti, G., Krause, J., Dvornik, G. P., Stanley, C., & Bindi, L. (2013). Platinum-group minerals (PGM) nuggets from alluvial-eluvial placer deposits in the concentrically zoned mafic-ultramafic Uktus complex (Central Urals, Russia). European Journal of Mineralogy, 25(4), 519-531. [var: Aurosmiridium] Heys Mineral Index 3rd ed. Logan, Clarence August (1918), Platinum and allied metals in California: California Mining Bureau. Bulletin 85, 120 pp. : 29; Pemberton, H. Earl (1983), Minerals of California; Van Nostrand Reinholt Press: 41. Logan, Clarence August (1918), Platinum and allied metals in California: California Mining Bureau. Bulletin 85, 120 pp. : 65, 109; Mertie, J.B. (1969) Economic geology of the platinum metals. USGS Professional Paper 630, 120 pp. : 94; Pemberton, H. Earl (1983), Minerals of California; Van Nostrand Reinholt Press: 41. Hanks, Henry Garber (1884), Fourth report of the State Mineralogist: California Mining Bureau. Report 4, 410 pp. (includes catalog of minerals of California pp. 63-410), and miscellaneous observations on mineral products): 310; Murdoch, Joseph & Robert W. Webb (1966), Minerals of California, Centennial Volume (1866-1966): California Division Mines & Geology Bulletin 189: 149, 229. Sjoberg, J. and Gomes, J.M. (1980) Platinum-group minerals in California alluvial deposits. US Bureau of Mines, Reno Research Center, unpublished manuscript: 15; Pemberton, H. Earl (1983), Minerals of California; Van Nostrand Reinholt Press: 41, 43. Logan, Clarence August (1918), Platinum and allied metals in California: California Mining Bureau. Bulletin 85, 120 pp. : 66-67, 78-79; Pemberton, H. Earl (1983), Minerals of California; Van Nostrand Reinholt Press: 43.
ⓘ Ten Eyck Placer Mines Inc.
Pemberton, H. Earl (1983), Minerals of California; Van Nostrand Reinholt Press: 44. Logan, Clarence August (1918), Platinum and allied metals in California: California Mining Bureau. Bulletin 85, 120 pp. : 66-67; Pemberton, H. Earl (1983), Minerals of California; Van Nostrand Reinholt Press: 43. Sjoberg, J. and Gomes, J.M. (1980) Platinum-group minerals in California alluvial deposits. US Bureau of Mines, Reno Research Center, unpublished manuscript: 15, figure 1; Pemberton, H. Earl (1983), Minerals of California; Van Nostrand Reinholt Press: 44. Pemberton, H. Earl (1983), Minerals of California; Van Nostrand Reinholt Press: 45. USGS (2005), Mineral Resources Data System (MRDS): U.S. Geological Survey, Reston, Virginia, loc. file ID #10305135. Murdoch, Joseph & Robert W. Webb (1966), Minerals of California, Centennial Volume (1866-1966): California Division Mines & Geology Bulletin 189: 290. USGS (2005), Mineral Resources Data System (MRDS): U.S. Geological Survey, Reston, Virginia, loc. file ID #10109530. Oregon Metal Mines Handbook, 1952, Oregon Department of Geology and Mineral Industries: Bulletin No. 14-C, Vol. 2, Section 1 - Josephine Co., 2nd Edition, page 122. Oregon Metal Mines Handbook, 1952, Oregon Department of Geology and Mineral Industries: Bulletin No. 14-C, Vol. 2, Section 1 - Josephine Co., 2nd Edition, page 134. Oregon Metal Mines Handbook, 1952, Oregon Department of Geology and Mineral Industries: Bulletin No. 14-C, Vol. 2, Section 1 - Josephine Co., 2nd Edition, page 123. In the collections of Jason McAvoy and Brent Thorne.